Want to let a teacher know that you are thankful for them? I've got an easy gift for a teacher that you can put together in about 5 minutes. Don't forget to download the free printable I have for you! Teachers work so hard during the school year teaching our children and they even use their own money to buy supplies for their classroom. It's nice to give the teachers a gift during the year, or teacher appreciation week, to let them know how much their hard work means to you. We usually buy a gift card for a restaurant and put it in a card from us. This year, my girls wanted to make something that was just from them. 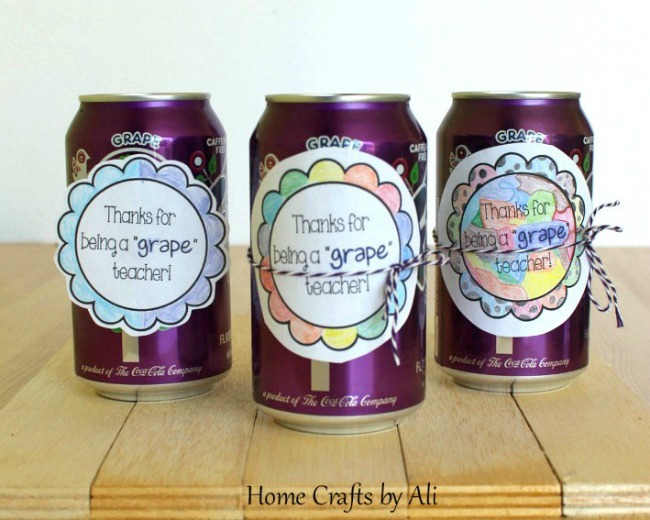 When we saw grape soda at the store, I knew it would be perfect for the gift. Note: I buy my bakers twine at Dollar Tree. They have two options of packs that have 3 different colors in them. For a dollar! Can't beat that price. I have used the twine for card making, crafts, decorating a bulletin board, and this gift. I haven't noticed any problems with quality at all with the twine. Download the PDF file of the printable that I created. There is a black and white copy or one with slight color added. When you download the file, it will not have my watermark across the page. Download B&W copy HERE. Download color copy HERE. Print the file of the tags on a piece of white cardstock paper. Cut out the shapes and get ready to color. When cutting, you can either just do a circle around the tag, or you can make it a bit more decorative and cut around the flowery petal shape of the tag. Either way looks nice. Grab your color pencils and have your kiddos color one for each of their teachers. This is a fun way for them to show their creativity to their teacher. My youngest colored light blue and purple, my oldest made a tag of many colors, and I colored a rainbow. Once the coloring is done, it's time to put the tag on the can of soda. I did this two different ways that I will share with you. First the super easy way that even your preschooler can help with! 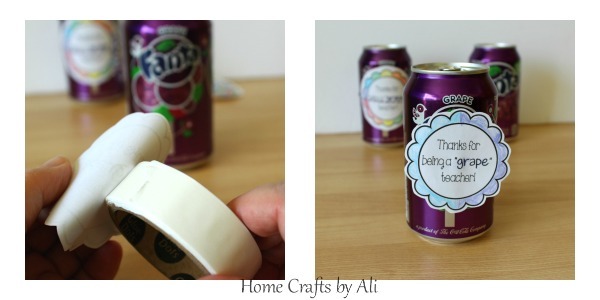 Place a small glue dot on the back of the tag and attach it to the front of the can of grape soda. That's it. Nice and simple. The second option is easier for older kids. Cut a piece of bakers twine so it will wrap around the can with a bit extra for tying a bow. Have them tie a bow around the label. If they have trouble making the bow while the label is moving, they can add a glue dot to the label to hold it in place then add the bow. There you have it! 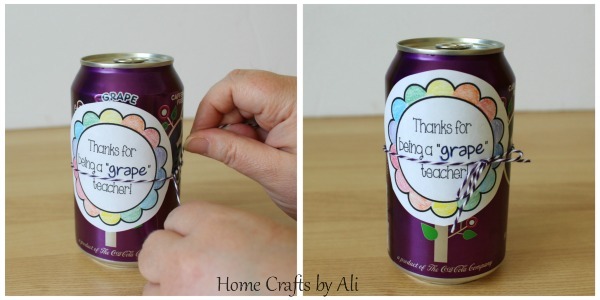 A quick and easy gift kids can give to a teacher. 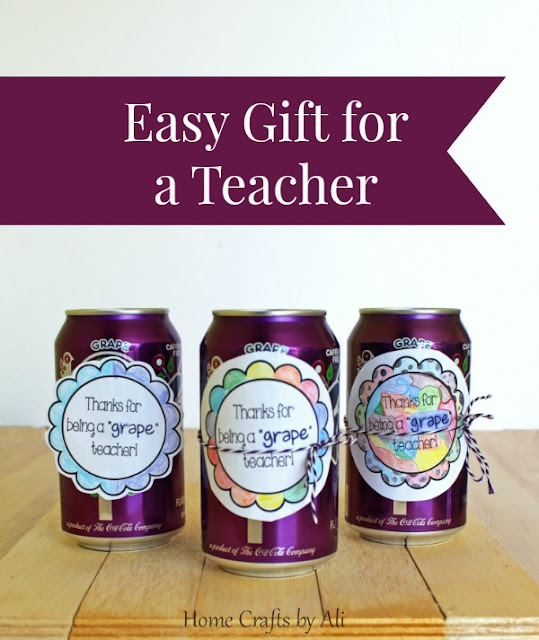 Want other ideas for gifts for teachers? 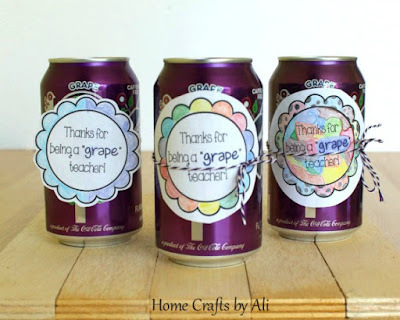 Check out my post 10 Quick and Easy Teacher Appreciation Gifts. This is a fun gift! My kids would have fun coloring the the gift tags. My girls loved that part too. It's always fun to see them share their creativity.